The Motorola Backflip is AT&T’s first smartphone powered by Google’s Android operating system. It’s an important move for the cellular carrier since it had solely focused on BlackBerry and iPhone smartphone until now. 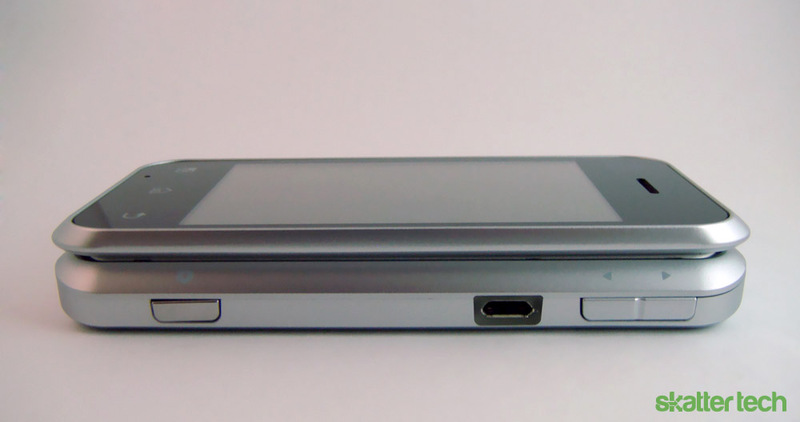 The Backflip isn’t just any Android phone, it’s a rather odd creation. Motorola used unique design which features a keyboard that folds backwards instead of a traditional slider or laptop-like hinge. 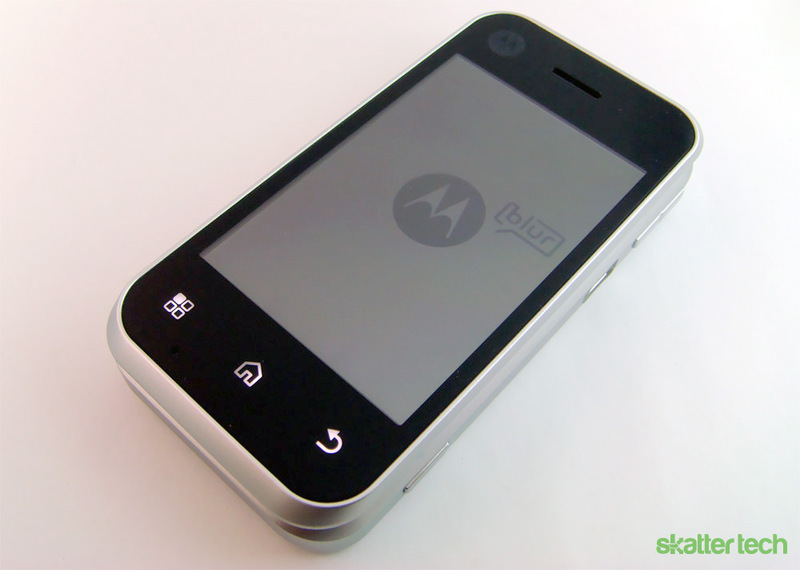 Although Android v2.1 devices such as Droid Incredible and the upcoming Android v2.2 Froyo update may make this device look outdated, the Backflip still has plenty to offer with Motorola’s Motoblur interface for social networking integration, a hidden touch pad for easier navigation, and a full QWERTY keyboard for heavy messaging. However those planning on buying this Motorola device should consider a few things first. Motorola literally flipped the traditional flip open design with this phone. 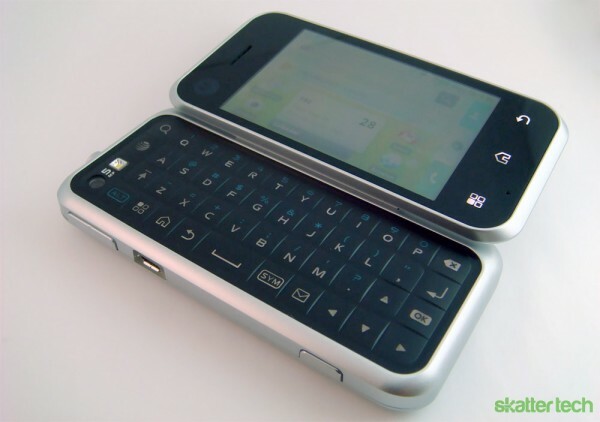 Instead of having screen close onto an internal keyboard, the entire device flips backwards, hence the name Backflip. Although I like the creatively designed hardware, this phone comes with some drawbacks. Both the keyboard and screen are entirely exposed at all times. In fact, it’s rather humorous that the enclosed portion has nothing fragile to protect. 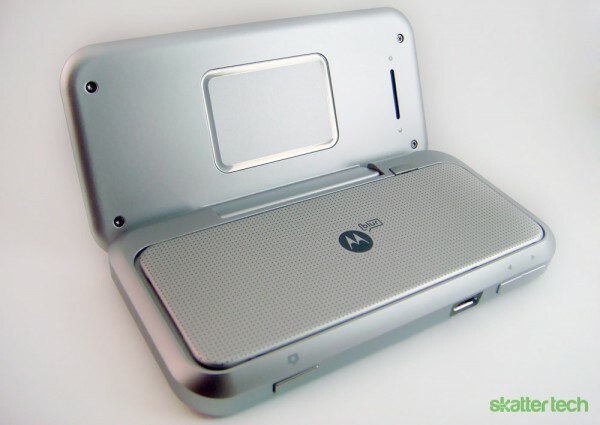 While the Backflip does feature a touch screen display, Motorola also placed a large touchpad, the Backtrack, behind the screen. Just like a laptop’s trackpad, it offers the ability to navigate through the interface and even double tab to perform an action. While there were occasions where the Backtrack was helpful, it often led to accidental operation. The Backflip features a flush power/screen lock button and a 3.5 mm headset jack on the top while a volume up/down rocker button, a camera shutter, and a microUSB port is on the right side of the phone. The body’s robust frame allows the phone to withstand a decent amount of wear and tear, possibly even a drop. 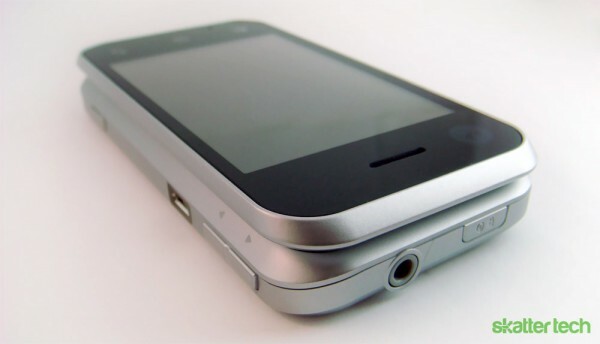 It’s smaller in just about every dimension when placed beside an iPhone 3GS, however it is a bit thicker. It’s easy to slide into even a tight pocket and light enough that it won’t add bulk to a purse. Unfortunately, the rest of the phone isn’t that exciting. It doesn’t have the 2010 sharp-looking design. Instead, it’s reminiscent of the LG enV VX9900 feature-phone that Skatter Tech reviewed ages ago. However, even that now-ancient phone is more practical than the Backflip’s design. Motorola’s social networking interface, which is heavily featured in advertisements and commercials, tightly integrates into the Android OS. Motoblur delivers status updates, messages, links, and photos from MySpace, Facebook, Twitter, and Photobucket to users through widgets. The interface offers five customizable home screens for these widgets and icons. It’s an innovative way to have information at a glance as opposed to wasting time launching dedicated applications. After signing into your social networking accounts, Motoblur fetches and merges contacts from Google, Facebook, Twitter, and MySpace into a single address book. If a contact’s name is slightly different, the interface offers a “link” button to consolidate items into a single contact. A fully-fledged Gmail application and calendar are also also available. Motoblur also adds some security features to protect personal information and application data. In some regards, it helps make the fear of a stolen phone a thing of the past. For instance, the free service continuously updates and backs up your contacts, login information, home screen customizations, emails, and social network messages onto Motorola’s servers. If a phone breaks, logging into Motoblur on a replacement device will instantly restore all data wirelessly. Users won’t need to deal with fetching drivers, remembering cables, and installing bulky software for a simple backup, which is a major plus. In addition, Motoblur’s website offers an option to instantly purge all data on the Backflip remotely if stolen. There’s even an interface to locate and track the phone from its website using the integrated GPS module for those willing to hunt down a lost device. The Backflip ships with the Android v1.5, which will hopefully get a v2.1 update soon. The current operating system lacks features such as multi-touch, speech-to-text for text input boxes, battery performance improvements, and a potential pattern lock by-pass bug, among other things that are available in the newer version. A first-time smartphone user probably won’t feel left out, however placing it besides a modern Android device will reveal all the missing capabilities. Fortunately, many of the beloved applications are there already: QuickOffice, a PDF viewer, and Google’s suite of applications. However the Backflip’s processor struggles to keep the interface on it’s feet. Lag is easy visible when sliding through different home screen windows. Multitasking or even launching a single application is considerably slower than a Droid Incredible or HTC EVO 4G. Unfortunately for the Motorola, the problems didn’t end there. I found that the screen often mis-rendered visuals and frequently froze when simply navigating through menus, exiting applications, or unlocking the phone. In addition, the Backflip would randomly reboot itself at least once a day. It would sometimes happen when simply plugging in the phone for a charge. I found that turning the screen off and on temporarily solved rendering issues and rebooting it every once in a while solved crashes, however it’s a major nuisance. The Backflip sports a 3.1 inch, 256k TFT touch screen with a 320-by-480 pixel resolution. It’s the same resolution as the iPhone but on a slightly smaller screen. Unfortunately, it can’t compare to the responsiveness, quality, or clarity of an iPhone’s display. Colors don’t look great, it isn’t easily visible under bright light, and is a bit too small. At the least, Motorola took some right steps by treating it with scratch-resistant finish since it’s exposed at all times. The glossy screen attracts smudges, fingerprints, and grime just like every other modern gizmo on the market. As for the Backtrack, it’s truly a neat idea. I can swipe to switch between pages on the home screen, scroll through web pages, and double tap to select an item. But why do users need it if there’s already a touch screen? They don’t. It’s simply unnecessary. I actually found myself accidentally touching it resulting in unwanted operations at times. Motorola could have possibly shed a few millimeters off the phone by excluding that feature. If there’s one thing the form factor of the display works great for, it’s making a great mini “table-top” information viewer. It’s great for a small alarm clock, slide show viewer, or YouTube player. Aside from the display, the keyboard is the next most recognizable component of the Backflip. 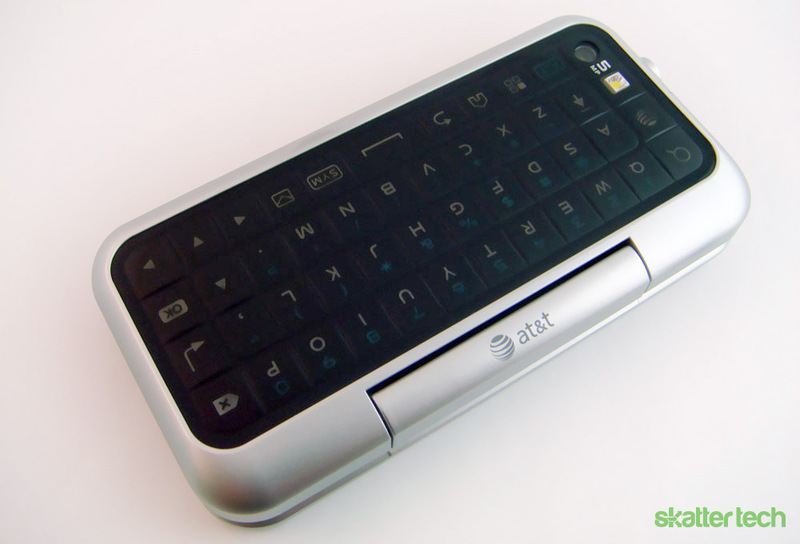 Since Motorola knew the keyboard would be exposed at all times, they opted for a plastic sheet design. And that’s exactly how it feels. It’s a flat keyboard with mildly raised keys and shallow indentations. It’s hard to distinguish between keys when rapidly typing. Although some getting used to may help, it doesn’t feel natural to use. Fortunately, Motorola packed backlit keys which makes it easier to type in darker environments. The keyboard also features dedicated menu, home, back, email, search, and web keys. Although I didn’t find myself using it at first, it does help improve productivity. There’s also a touch-screen keyboard embedded into the operating system for when the physical keyboard isn’t flipped out. Regrettably, it offers a miserable experience. It’s unbearably laggy for typing at a decent pace. Not to mention producing inaccurate key presses. Despite my complains about the physical keyboard, I would use it over the virtual one any day. Hopefully the updated keyboard in the upcoming Android v2.1 will offer improvements. The Backflip’s camera is unsurprisingly positioned at an odd location. It’s at the bottom left corner of the keyboard. It’s definitely a concern that extended use may result in faster wear and tear for the camera’s lens. As for the technology behind it, it’s a 5 megapixel camera with a 4x digital zoom. A built-in flash also helps improve images taken in low-light situations. The camera app starts within 5 seconds or so. The viewfinder is surprisingly responsive. Snapping a shot takes a second longer than it probably should, possibly leading distortion from movement. The auto focus fixes in on an object quickly and even makes a great device for self-portraits since the camera flips over along with the keyboard. The included 2GB card doesn’t offer much storage for either images, videos, or music, however it’s easily expandable up to 32GB. The interface offers some options to control the flash, enable geotagging, and use some color effects. Call quality is decent; it’s AT&T’s network. I found some unusual static noise, but not enough to be severely problematic. As for the speaker phone, it’s respectably loud for a fairly small phone, but nothing exceptional. Interestingly, I found that signal strength would improve when the phone was unfolded, possibly even offering an extra bar or two. Unfortunately, having to hold the Backflip open up to your ear isn’t very practical. The phone supports Bluetooth headsets, which is an absolute essential for phones especially with states across the country passing hands-free laws. Voice commands didn’t work through the headset without some interaction with the handset, which is a major issue. The Backflip packs a 1400 mAh Lithium-ion battery. Motorola claims a 6 hour life talk time, which was about accurate with my usage. I also found that disabling the built-in WiFi and GPS would also offer a little more longevity. For the most part the Backflip should last through an entire day with mixed usage of web browsing, texting, checking emails, listening to music, and using some Android Apps. The device charges with the included microUSB charger, which unfortunately can’t also be used as a modular USB cable like newer phones. The battery is also replaceable if it begins to wear out over time. For standby, the phone should at least make it through at least 3-4 days with some charge left over. While Motorola tried with the Backflip, it simply isn’t a viable option for AT&T customers. Unless there’s a person that absolutely needs the Android OS and can’t leave AT&T, there’s no reason to buy this. For instance, the 8GB model of Apple iPhone 3G goes for the same price $99 price on AT&T’s website after signing a new two year contract. The iPhone has an uncountable number of advantages over the Backflip. Plus, both phones have the same monthly data pricing plans, so users would pay the same amount for both by the time their contract ends. While newly launched Android devices such as the Droid Incredible and HTC EVO 4G are revolutionary, this Backflip isn’t. Even the 6 month old Motorola Droid is a better bet on Verizon’s network. For now, if you are restricted to AT&T, buy an iPhone, it’s the best they have to offer. That’s at least until AT&T picks up some good Android devices. ok well i am going to buy this phine for my birthday but i am just wondering well i am so hooked up of what this phone has to offer so will this phone be sutible for a 12year old girl which is me ???????????????????????????????????? I just got this phone for my wife on Sunday, and it is an excellent choice for a first time smart phone user, such as yourself. There certainly are better phones out there (on other carriers besides AT&T). But, you can’t beat the price (I paid $79 at Costco). My brother is 10 and has a phone that isn’t prepaid, as well as his own laptop. I had the same when I was 10. I see nothing wrong with 12 year olds using a phone. should i get this phone? is it really that great as it look??? whatever happened with that boy and his phone it’s his fault don’t blame the phone. It’s great!And the girl should be able to get it. It’s awsome!!!!!!!!!!!! i am getting this phone from at&t warrenty and it doesn’t mean anything with your age if you break a phone i have been through 12 phone and i am 16 so yeah ! but this phone seems like a good choice and its good for yunger people becuase and can do more senice we actually have lives!!!! okay, im 13 and dnt nessecarly HAVE TO HAVE A PHONE but its a really good thing that i do. im in a lot of sports, so its good to have one to get ahold of my parents after pactices. Okayy… Soo like I’m 16… I think this phone looks cool and I want to ask for it for Christmas… Is it really as cool as it seems or should I go with something better?